It's the deep of winter now. A cold rain beats against the northeast side of Phaeth. We are relegated to the indoors again which gave me some time to do a computer back up and move some files around and tidy up the hard drives. In doing so I ran across a note I had saved for myself last May and posted it back then when the weather was quite a bit improved from today. The man with one leg. Yesterday, a beautiful 2006 Country Coach Inspire with a shiny aluminum trailer with an obviously pampered Thunderbird convertible on its back pulled in next to us. The driver was a man about my age and his wife. Joanie was looking out the window because he was unloading his car and the straps were making quite a bit of noise in the process. Joanie noticed he had only one leg, the other missing from the hip. Sweat was already dripping from his brow and staining his t-shirt and shorts. 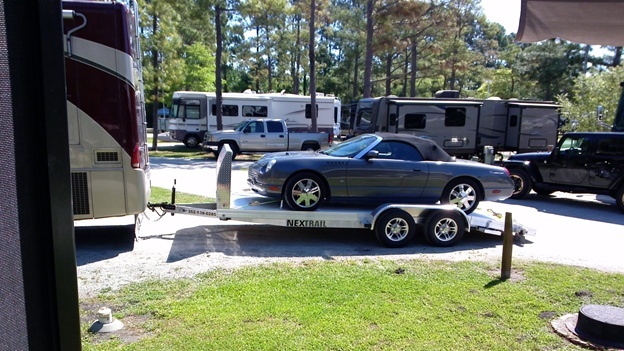 With crutches, wearing work gloves and one knee pad he moved knowingly about the coach and the trailer to unload the little convertible. Joanie suggested I go out and ask if he needed help. I met him over the hood of his Thunderbird and commented on the v-8 power that could really make this little car scoot. He paused and made conversation about staying only one night and wanting to see the sights in Wilmington and I talked about the traffic in Wilmington which I have always thought very bad for a town this size. Then, not wanting to hold him up I offered help if he needed, just holler next door. He was gracious and said he thought he was OK and thanked me. I went back to Joanie but continued to watch him out the window “just in case”. I could tell he knew what he was doing; RVers go through the same routine of setting up and taking down the campsite so often they do it efficiently wasting as little energy as possible. He went through the steps just like any other RVer has a million times. But he did it on one leg; sometimes using his crutches, sometimes sitting on the trailer bed, sometimes hopping about on one foot. He got the job done. They left this morning after breaking camp in reverse routine. There are times and ways God talks to us that we don’t realize. He shows us how strong we can be, how agile we can be, how tenaciously we should live the life He has given us and to give thanks for the blessings He has given us.